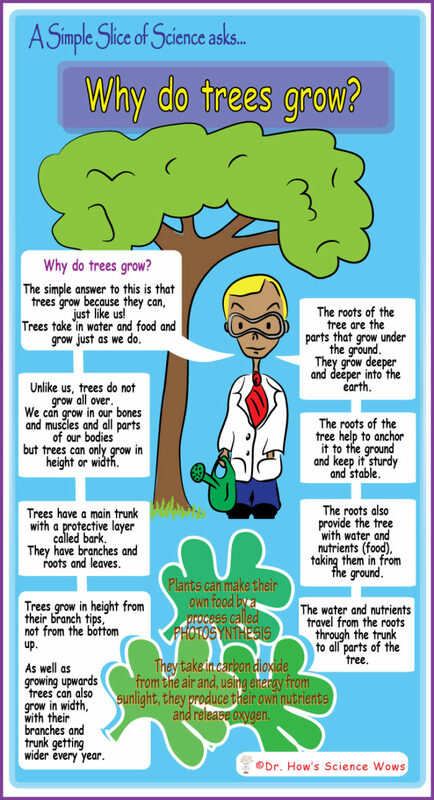 A Simple Slice of Science – Why do trees grow? Dr. Simple had to keep himself firmly rooted on the ground to answer this one… I hope this answers your question Eleni! Transpiration is the process whereby water is taken into a plant by the roots, transported up through the plant and released from the leaves as water vapour! Transpiration is a bit like perspiration (sweating) in humans – it helps to keep the plant cool! As the water vapour transpires out of tiny holes (called stomata) fresh water is drawn up from below. This means there is always an unbroken tower of water running from the bottom to the top of the plant at all times. Water travels up the plant through tubes called Xylem. The constant flow of water through the xylem tubes of the plant is called the transpiration stream; this stream keeps the stem firm so that it can support the weight of the plant. Plants put roots down into the soil to draw water and nutrients up into the plant. Transpiration accounts for up to 10% of water in the atmosphere! Some trees can loose hundreds of thousands of litres of water in a single day through transpiration! The water vapour trees transpire into the air cools the air! Transpiration can lift water all the way to the top of the tallest trees! Stomata are tiny holes or pores on leaves, stems and even petals of the plant that allow water out of the plant (transpiration) and gases (like carbon dioxide) into the plant. Most of the stromata of a plant are found on the underside of the leaves. Stomata can open and close to control the amount of water leaving the plant or the amount of gas coming in. An experiment to try at home: Tracking the flow of water! Step 4: Leave for a few hours (or overnight) and see what has happened! So what has happened?…The coloured water travels up the stem and eventually reaches the flower where it changes the flower’s colour. What could you change or what other things could you try?… What would you change if you repeated this experiment? You could try it using a variety of different types of flowers to see if one type works better than another. You could vary the amount of food colouring you use. I had planned a different blog for today but something funny happened yesterday evening and it has lead me down a different path! 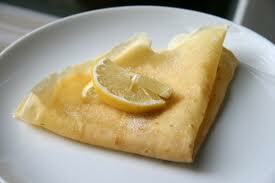 My children commented on the nice smells from the kitchen and asked me what was for dinner…. “Carbonara” I replied. The two oldest started to chat and whisper to themselves and I was bracing myself for some kind of “I don’t eat that” protest, but instead they just asked the question again…..”What did you say we are having Mum?”. This time they heard my answer more clearly and the two of them cracked up laughing. I couldn’t understand what was so funny until the laughter subsided and they told me….. This lead to a super nerdy science discussion over dinner about all things carbon dioxide like. The little three year old was very proud of himself telling the others how he made carbon dioxide is his science video with mammy. I have posted this one before but here is a link if you want to see the little Einstein in action! I was surprised at how much the children knew and how interested they were about carbon dioxide. It is a simple but essential molecule that is an integral part of life on earth. Carbon Dioxide is a colourless gas. It is made up of one carbon molecule bound to two oxygen atoms and is written as CO2. 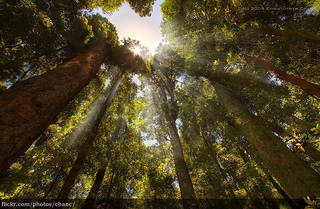 Although CO2 makes up less than .04 % of the gases in air it is crucial for the existance of life on earth as we know it. Most of us know that we need oxygen to breath but plants need CO2 for their survival. Green plants take CO2 in from the air and, using energy from the sun, break the molecule down into carbon (C) and two oxygen molecules (O2). The carbon is kept by the plant and converted into starch and sugar. This process is called Photosynthesis. The O2 is then released into the air by the plant. So how does CO2 get replenished back into the air again? This happens through a process called respiration! Animals (including us humans) breath in O2 into our lungs and pass it to every cell in our bodies, through our bloodstream. Our cells need this O2 to grow and to make the energy that powers the body. 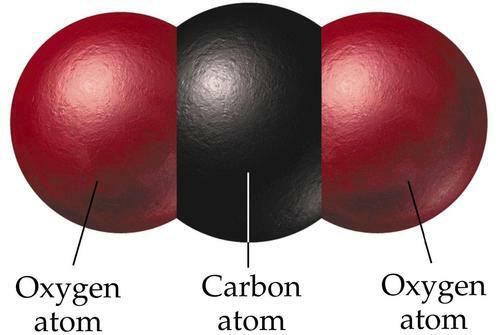 During the body’s energy making process some of the carbon (from our food) is combined with the O2 forming CO2. This is a waste product in our bodies so it is carried back to the lungs to be released into the air in our breath. You can start to see a cycle emerging in all this; plants take in CO2 and convert it to food (sugar and starch) and O2. The O2 gets released into the atmosphere. Animals eat the plants and break down the sugar and starch, combining the C part released with O2 forming CO2 again! This is called the carbon cycle. 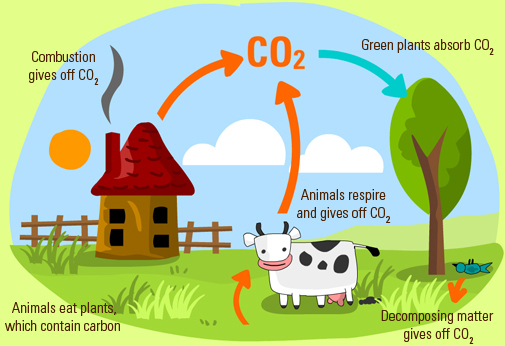 Other things contribute to the carbon cycle: Carbon is present in our bodies, in fact it is present in all animals, and plants, even rocks and dirt. When bodies and plants die and rot this carbon ends up in the earth. Over time some of this carbon get converted into fossil fuel such as coal, peat or oil. When we burn these fossil fuels the carbon gets combines with oxygen releasing CO2 back into the atmosphere. Another step in this cycle is what the plants do at night! In the absence of sunlight plants switch to respiration, which means that, just like us, plants take in O2 and release CO2. CO2 exists as a gas at standard atmospheric temperature and pressure. It will freeze into a solid state at temperatures below -78oC. Solid CO2 is often called “dry ice”. Dry ice can be used to create a fog or smoke effect and is a great ingredient in many fun science experiments. One of my favourites is making a big bubble using dry ice – I found this demo showing how (click the image below to link to the experiment). If you ever do get some dry ice make sure you work with an adult supervising as it is VERY COLD! An interesting fact about CO2 is that it does not exist in a liquid state at standard atmospheric pressure. This means that under normal conditions dry ice will turn straight into a gas as it thaws (i.e. it does not go from solid to liquid to gas as most substances do). This process (solid straight to gas) is called sublimation. Some of the gases within our atmosphere are known as greenhouse gases as they absorb some of the sun’s heat that is reflected off the earth and stop it escaping into space. 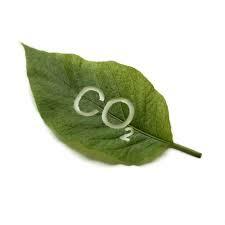 CO2 is one of the greenhouse gases naturally present in our atmosphere. These greenhouse gases maintain the earth’s temperature and this process is called the greenhouse effect. If the level of a greenhouse gas changes significantly then we experience global climate change. Global warming is the term used to describe an overall increase in global temperature due to an increase in greenhouse gases in our atmosphere. Increased levels of CO2 are thought to be the main contribution to current global warming; These increases are primarily due to the large number of fossil fuels burned by humans and a vast and steady decline of trees globally. Recent reports show a 30 percent increase in atmospheric CO2 levels since the dawn of the industrial revolution. While there is still much debate about the extend of global warming it would appear that consequences such as melting ice caps, rising water levels, global temperature increases, droughts and floods must, at least in part, be attributed to human actions! Science has turned it’s attention to natural and renewable energies that provide some solutions to preventing and potentially reversing many of the current issues observed with global warming. Did you know that some types of fire extinguishers contain CO2? You can make a “mini” fire extinguisher using just vinegar and breadsoda….. but I thought I would let the experts show you!